ʻUluʻulu: The Henry Kuʻualoha Giugni Moving Image Archive of Hawaiʻi aims to perpetuate and share the rich moving image heritage of Hawaiʻi through the preservation of film and videotape related to the history and culture of Native Hawaiians and the people of Hawaiʻi. ʻUluʻulu is a special project under the Academy for Creative Media (ACM), University of Hawaiʻi System. 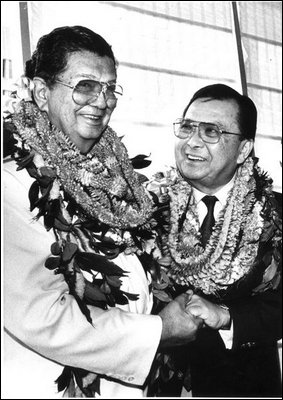 It honors the former United States Senate Sergeant-At-Arms, Henry Kuʻualoha Giugni, the first person of color and the first of Polynesian ancestry to hold the position, who died in 2005. Efforts to move this project forward have been led by Heather Giugni (Archives Consultant) and Chris Lee (Founder and Director of ACM and Archives Principal Investigator). Phase I of this project began in October 2008 and resulted in the hiring of a Project Consultant who wrote a 100-page Report on the state of moving image preservation in Hawaiʻi and created an implementation plan for establishing an archival facility. Phase II was the Beta Pilot Program, a collaborative effort between the Archives and local institutions, filmmakers and educators that built upon the consultant’s report to create a representative digital collection of Hawaiian film and video, and implemented standard processes for digitization, preservation, and access. Phase III will lay the foundations for a long-term and fully operational Archive through the establishment of a permanent physical location on the new UH West Oahu campus in Fall 2012.